With Brian Doyle’s reliable good humor, this collection reveres human efforts and love in situations both moving and laughable. The Mighty Currawongs and Other Stories by Brian Doyle (Martin Marten) roams broadly in subject matter, but always offers joyful, whimsical wordplay and an abiding love for life’s absurd and profound moments. 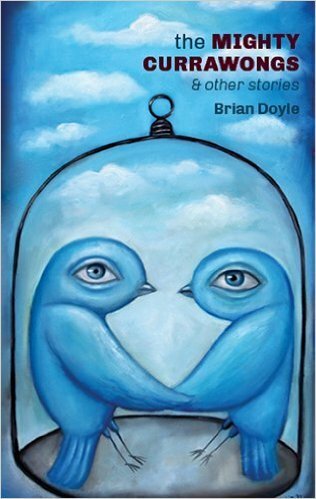 These short stories–almost all under 10 pages–deal specifically with human experiences and relationships, rather than embracing the wider natural world of Doyle’s novels, but the same voice and fanciful tone appear clearly. A Boston basketball league plays through hilarity and scuffles, and finds a player who deepens the game. A likable archbishop loses his faith; a grandfather teaches his grandson to play chess; a tailor offers a young newspaperman sartorial and other advice. Through these everyday incidents, Doyle’s approach to the world is poignant (as in a veteran’s memories of the Vietnam War) but steadfastly hopeful. Indeed, the only criticism of his work might be for his unrelenting optimism, expressed by consistently likable, essentially good characters. But with his mastery of language and eye for detail, Doyle’s characters always feel authentic, and their ups and downs are realistically proportioned. His gift for finding the sublime in even the small and dirty details is alive and gleaming in this short story collection. This review originally ran as a *starred review* in the September 30, 2016 issue of Shelf Awareness for Readers. To subscribe, click here, and you’ll receive two issues per week of book reviews and other bookish news. Rating: 8 halves of the door.